So, you have just found out you are pregnant. The mega turn in your life which will change you for the rest of your life. You now have a living being growing inside you. Its general health and well-being is all dependent on you and what you eat. Now you eat not just for yourself but for the nutrition of the child growing inside you. The famous “eat for two” line that you hear from everyone around you does not depict eating hefty meals all-round the day, but eating small and nutritious meals throughout the day. It is important to eat well during pregnancy. Expecting mothers need 300 extra calories per day. Vitamins play an important role in the development of the baby, and Vitamin A is one of them. Vitamin A plays a vital role in the healthy development of the fetus and the new-born. Vitamin A is important for expectant mothers because it helps in the formation of the nervous system of the baby, and it is also one of the building blocks for the formation of kidneys, lungs, bones and heart of the fetus. It helps in the formation of normal cell development, healthy body growth and reproduction. Vitamin A is known to be of great use in formation of healthy skin in both the mother and child. It helps in the formation of healthy teeth, skeletal and soft tissues as well. Vitamin A works together with a particular form of protein known as optin, that forms the visual pigment. This Vitamin will enable the retina to send nerve impulses to the brain to form an image. It allows the eye to distinguish between light and dark. This vitamin promotes good vision especially in dim light. Its deficiency may lead to night blindness or complete loss of vision both in the mother and the child. Thus one should eat abundant of fruits and vegetables that contain this vitamin during pregnancy. These cells are formed from the stem cells and stem cells depend on Vitamin A for distinguishing blood cells. Vitamin A also helps in blending the hemoglobin into the newly formed red blood cells of the baby. 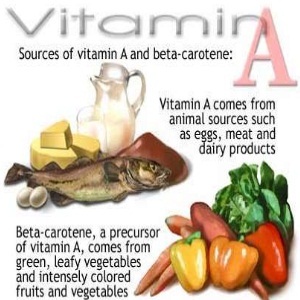 Vitamin A is also known to inhibit the formation of cancer forming cells especially those related to the skin and internal tissues both in the mother and baby. Vitamin A boosts the immune system, by increasing the activity of antibodies in the mother. It keeps the mucous membrane cells healthy. This inhibits the formation of infectious diseases, which can be dangerous during pregnancy. It helps in the storage of fats which enables you to avoid infectious diseases like common cold, pneumonia, diarrhea, asthma and measles. During pregnancy, doctors seldom give antibiotics, thus this natural form of antibiotic is recommended for would be mothers. Vitamin A not only plays an important role in the development of the baby but also for the expectant woman. It helps in the tissue repair maintenance of the entire body, including the eyes. At the later stages of pregnancy, intake of Vitamin A is an important factor which aids in lactation.